These are the words of Nancy* from Pennsylvania, who unknowingly struggled with binge eating most of her life. At the age of 62, Nancy was diagnosed with binge eating disorder and sought treatment. Some might say Nancy is not your ‘typical’ eating disorder patient – teenage/college age, single women. However, according to clinicians at The Renfrew Center, a nationally renowned eating disorder treatment facility, they have been treating women similar to Nancy in age, and even older, for the past 31 years. In fact, The Center has seen a 42 percent increase in patients in that age range who have been in the residential level of care. Women in midlife face many of the same eating disorder struggles as adolescents and younger women (i.e., body dissatisfaction, body image distortions, fear of food) — however, these issues are often exacerbated by the added lifespan concerns that accompany the aging process. Often, women in midlife find themselves faced with new stressors, such as marital discord, divorce, ‘empty-nest syndrome,’ menopause, chronic illness, career changes, and rumination over “what have I accomplished in my life?” Our society’s emphasis on youth and thinness is an overriding factor that is difficult for this age group to disregard. Loss is also a serious issue for women at midlife – whether it is the loss of youth, the loss of children heading off to school or living independent lives, or the loss of elderly loved ones. 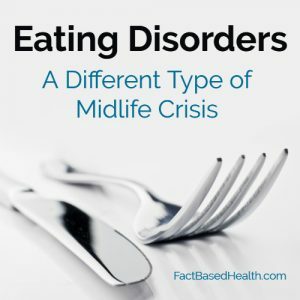 The majority of midlife women with eating disorders have usually experienced some degree of disordered eating in their past. Many have struggled with episodes of anorexia, bulimia or binge eating disorder in their teens and twenties; others had untreated disorders which re-emerged in midlife. For some at midlife, however, a crisis or trauma can be the trigger for an eating disorder when there is no reported history leading up to the event. Unbeknownst to Nancy, her eating disorder began at age 13 with those occasional binges. As she grew older, food became her coping mechanism when life threw curve balls, whether it was a failed diet or dealing with family stressors. The more she relied on food, the more food she consumed. She was always thinking about where she would get her next round of food, where she would eat it, how would she get rid of the ‘evidence,’ etc. It was controlling her life. As she entered retirement at the age of 60, Nancy was determined to get healthy. To accomplish this she thought she had to get skinny with yet another diet. She met with her primary care physician to discuss a new diet pill. As the conversation progressed, Nancy was shocked when her doctor said it wasn’t a diet pill that would make her healthy; she needed to seek treatment for her binge eating disorder. Binge eating disorder is characterized by episodes of uncontrolled eating or bingeing followed by periods of guilt and depression. It was with that diagnosis and referral to The Renfrew Center of Southern New Jersey that started Nancy on her recovery journey. She attended Renfrew’s Intensive Outpatient Program three evenings a week for two months. With a multidisciplinary team of therapists, dieticians and a psychiatrist, Nancy began addressing issues that were driving her eating disorder. She found that understanding the different parts of her emotions and learning to tolerate them without engaging in her eating disorder symptoms were extremely helpful in the healing process and in everyday life situations. Furthermore, she discovered support and strength from the community of women with whom she attended the program. No matter their age, diagnosis or where they were in their recovery journey, she related to each of them on some level. Midlife women often report they are slow to seek treatment because they experience feelings of guilt for leaving behind their family members or work obligations. They are accustomed to putting everyone else’s needs above their own. The good news is that treatment tends to be successful for this demographic, because the women often are motivated and devoted to their recovery. So much of the treatment process is recognizing they are worthy of recovery and deserve to be happy. In response to the increasing number of midlife women seeking treatment, The Renfrew Center has designed specialized programming to help meet this population’s unique needs. The Thirty-Something and Beyond program allows women 30 and above to address their own special issues within a community of their peers – women struggling with similar issues around nutrition, wellness, relationships, exercise and self-nurturing. *Name has been changed to protect patient’s privacy. Have you ever wondered what it would be like to go to therapy? Psychotherapy has been thought of in the past as mysterious; an experience where a therapist does something to a patient who is expected to passively receive treatment and be cured. Another idea people have about therapy is that it is something a person does for years, possibly for his entire life. This might be true in the movies, but in real life, therapy can be a lot more straightforward and short-term than that. If you would like to know what happens in a therapy room, just ask a therapist! He will likely tell you what methods or techniques he is trained to use to help people with their problems. One type of therapy that is widely practiced and a highly effective way to treat a variety of mental health problems is Cognitive Behavioral Therapy (CBT). A key component of this type of therapy is that the patient and the therapist work together to develop a trusting therapeutic relationship and set clear goals for what the patient wants to change about his life. Together, they collaborate in carrying out a plan to meet these goals. This can be a helpful and hopeful approach when a person is suffering and sees a dark tunnel ahead with no end in sight, because, as part of the therapy process, it defines what that light at the end of the tunnel looks like and how to reach it. 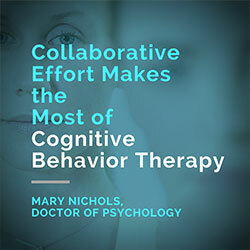 A person that visits a therapist who uses CBT is likely to do some talking, listening and activities designed to help him understand the link between his thoughts, feelings and behaviors. He also will practice new behaviors that will help change his life in a positive way. For example, someone who suffers from depression might use therapy sessions to talk with his therapist about the kind of thoughts he has about himself and the world around him. He might explore thoughts of hopelessness and low self-worth that lead to feelings of sadness, and then see which thoughts are strong enough to be considered “core beliefs.” Then, the therapist might help him challenge his thinking when it is distorted in a negative or pessimistic way. In addition, the therapist would work with him to come up with ideas for actions to take that are different from the way he usually spends his time. For instance, depression will often cause a person to isolate himself from other people and disengage from relationships that have the potential to provide relief from depression. He might stop doing activities he once enjoyed, or stay inside and avoid healthy activities like getting the right amount of sleep and exercise. A CBT therapist can work with someone who is depressed to set goals, nurture healthy relationships, and plan to do pleasant activities. This can take the form of “homework” which is done between therapy sessions so that what happens in the therapy office can be taken out into the real world and new skills can be practiced. When the person meets with the therapist again, and discusses the thoughts and feelings about the new behaviors he engaged in, the healthy patterns that alleviated or prevented depression can be encouraged. CBT is often time-limited, structured and directive. It can take just eight-to-10 sessions until the person feels relief from his symptoms and is ready to move on from therapy and return to his life. The objective is that he has learned new skills and behaviors that can be used without the therapist’s help. Therapists joke that the goal of their work is to put themselves out of business. We do want our clients to benefit enough from the work they do in therapy to not need it anymore, get to the end of the tunnel and come out stronger on the other side. When we talk about depression, we are usually referring to unipolar depression. 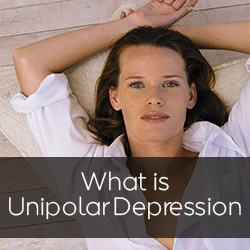 However, there are actually two different types of depression: unipolar and bipolar. Both types can share very similar symptoms, particularly in the beginning, but actually are traced to different biological circumstances. Depression should be diagnosed and treated by a professional for the best chance of recovery. If you have a friend or family member with unipolar depression, understanding how to help them can be a challenge. Unipolar depression, or ‘major depression,’ is understood to be the most common type of depression. It is associated with symptoms such as changes in sleeping and eating patterns, feelings of depression that last longer than two weeks, and an ongoing lack of motivation. It can be caused by a number of factors, from traumatic events such as death or injury to chronic stress. Some people are more vulnerable to depression than others. And although the condition can be treated, it is not viewed as curable. There’s no formula for depression; some people may display all of these symptoms, others only some of them, and others still may have different symptoms altogether. It’s not your job as a friend to diagnose depression, but you can pick up on the signs. Typically when symptoms last for two weeks or longer you may be looking at clinical depression. Depression is a persistent, ongoing condition that can benefit from professional treatment. Watching someone close to you deal with depression can leave you both feeling helpless. Depression can come on slowly or quickly and the risk of suicide is a possibility. That’s why it’s so important to let the person know that they are not alone and that they are loved and valued. There are many ways to help someone with depression as they work through recovery. Depression is a widely misunderstood mental illness, despite its prevalence. Do some research to give yourself a better understanding of what someone with depression goes through and how treatment works. If someone’s having a bad day you may be inclined to remind them to smile, or even suggest that they ‘snap out of it.’ When someone has depression, these phrases are not helpful. In fact, they dismiss the gravity of depression, treating it as something that can be overcome with willpower. Depression is not the result of a weak mind; it is a chemical and biological condition that can strike without warning. People with depression often feel alone and reject the offers of help from those around them. In some cases, that leads to friends and family members withdrawing, to the point where that person feels more alone than before. Taking a step back and waiting for the person to ‘get back to normal’ isn’t the best way to handle the situation. Make sure they know that you are there for them, every step of the way, and won’t take off if things get hard. Talk to them to let them know they aren’t alone. Look into reputable treatment programs and talk to the person about entering treatment (if they have not already done so). You can make appointments to visit treatment facilities and break down the mental barriers to treatment that exist for many people who often are afraid to ask for help due to prevailing stigma. There are frequently warning signs when someone is contemplating suicide. This can include a sudden fascination with death or dying, risky behavior, giving away possessions, talking about suicide, or even saying goodbye to people. If these symptoms appear, don’t wait for them to go away. Call a suicide hotline, contact the person’s doctor, and keep them in safe surroundings. Depression shouldn’t be taken lightly, but it doesn’t have to destroy your life. Many people do recover from depression and go on to lead happy, healthy lives. The more we understand the symptoms and treatment possibilities for depression, the more people can be helped. 1. Acupuncture: As a therapy, acupuncture has been found to be very effective for treating depression. It’s been shown in FMRI studies to affect the hypothalamus pituitary adrenal axis in the brain, which in turn controls the limbic system, a part of the brain that deals with emotions. When this happens, serotonin and endorphins, considered to be ‘feel-good’ chemicals are released by the brain. The sympathetic nervous system or the “fight or flight response” is calmed down. Of course, a practitioner will always tailor the treatments to a patient’s specific needs. When performed regularly, acupuncture can have a real impact on easing the effects of depression. 2. Yoga and Tai Chi: The benefits of exercise especially as a treatment for depression have been widely documented, but its not just high-intensity workouts that do the trick. Consider slowing down with the ancient practices of yoga and Tai Chi Chuan (also known as Tai Chi). These practices combine soft, gentle movements with diaphragmatic breathing to help achieve relaxation. And the benefits don’t stop there! Recent research has confirmed that these practices can improve mood, lower blood pressure, improve heart function, reduce pain, relieve fibromyalgia symptoms, and improve balance. 3. Herbal Medicine: The use of pharmaceutical drugs to control depression can at times have very powerful negative side effects such as headaches, nausea, jitters, insomnia and addiction. If you’re wary of prescription drugs, opt instead for Traditional Chinese herbal formulas, which have been used for centuries for combating anxiety, stress, and depression. 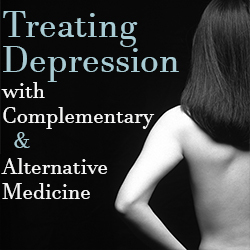 Some of the herbs in the most common formulas for depression are milkwort root, the root of a beliflower called codonopsis pilosula, Japanese sweetflag, bupleurum or thorowax root, ziziphus or Chinese dates, bitter orange, Chinese cedar seeds, lophatherum ( a type of bamboo), and tumeric. A good herbal practitioner will create a special formula or combination of formulas for each patient’s special needs. These simple Eastern remedies can have a real impact on the management of depression and anxiety, taking you from stressed to soothed in no time. And remember, if this becomes too much to manage, you are not alone, turn to a professional for help.